A few days after I posted my Wabakimi trip report I became very busy at work. I worked some very long days and put in some long stretches without a day off. I was finally able to get up north and put up my tree stand for deer hunting this past week-end. 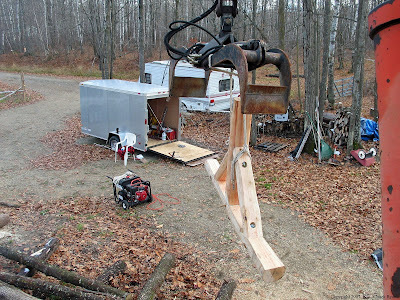 I started a new permanent stand for my dad and he’ll finish it up later. He was also working on another enclosed tree house to view the wildlife. Besides working on the tree stands I was able to start my toys before winter set in. 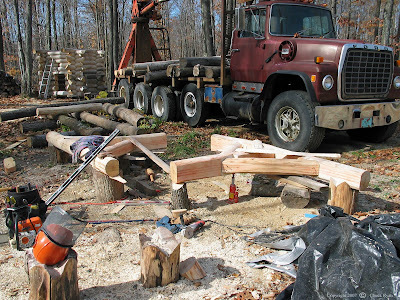 I have an Oliver 1650 tractor and a 1977 Ford LTL9000 logging truck with a Hood 7000 knuckleboom loader that use for log building. Since I got back into canoe racing this year I didn’t do any log work. Both pieces of equipment started up on the first try. It was nice to be back up in the woods on my property. I put out a trail camera at my dads deer feeder to see what size deer are in the area. The problem is I probably won’t get back up to retrieve my camera until after the start of the hunting season. My tree stand with camo around it. Photos below were taken a couple years ago.